“There is a request for medical visa for 5 year old child Anamta Farrukh who is suffering from eye cancer for her treatment in India. I have asked @IndiainPakistan to issue medical visa for treatment of the child in India immediately,” she said on Twitter yesterday. She also said another Pakistani child requiring bone marrow transplant was being given visa for treatment in India. 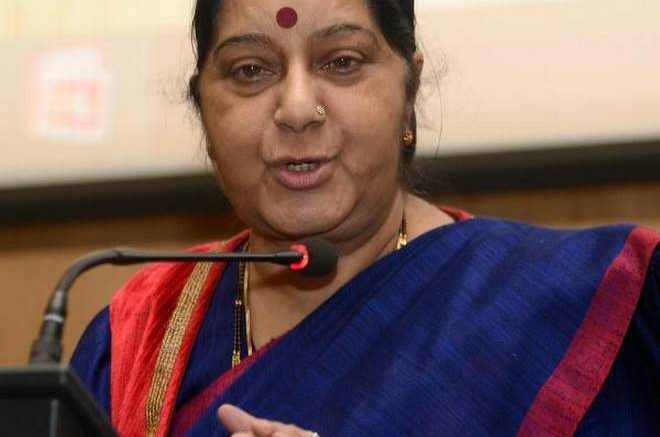 Swaraj announced that two Pakistani men also given medical visas for liver transplant. “We have approved medical visa for the liver transplant of your father Syed Baseer Imam Zaidi and pray for his long life,” she said. Zaidi’s son Syed Adnan requested her to facilitate visa approval to his father. “I have asked Indian High Commission in Pakistan to issue visa for the liver transplant surgery of your father in India,” she responded to the plea of another Twitter user. Be the first to comment on "Sushma Swaraj asks Indian mission to grant medical visa to Pakistani girl for cancer treatment"